Personal injuries, including slip and fall claims, rest on the idea that a person or company needs to keep an area safe for those who visit. Fail to remedy a dangerous condition. Fail to warn others of a dangerous condition. Report the accident to the owner. Demand that an incident report be filled out. Gather contact information of potential witnesses, including names, addresses and telephone numbers. Take pictures of the premises and your injuries. If you have any injuries at all, make sure you get medical treatment. Save any clothing you wore that day, especially your shoes. Do not continue to wear them. Keep your empty prescription bottles. Keep a copy of all the medical reports and bills you receive. Consider contacting a slip-and-fall attorney for a thorough review of your case. The guidance of a slip-and-fall attorney dramatically improves your chances of recovering benefits in a slip-and-fall claim. 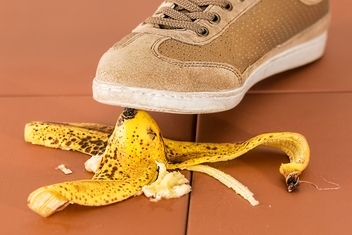 Who Is Liable in My Slip-and-Fall Case? Injured visitors can hold property owners accountable for their negligence by filing a premises liability claim. Did You Slip and Fall at Work? Slip-and-fall injuries can occur at anytime. A claim usually involves a negligent property owner and an unnecessary hazard. Whether by stepping on unmaintained stairs, slipping in a puddle of water, or sliding across a slick floor, people can become injured by slipping and falling because of someone else's negligence. If you or a loved one have been injured in a slip-and-fall accident, you may be entitled to receive compensation for medical care, lost wages, and other damages. What Is Your Next Step In Recovering? It is never easy recovering from an accident. Our firm sees many slip-and-fall accidents that occurred while our clients were on the job. In these cases, you may have both a workers' compensation claim and a premises liability claim. Coye Law Firm is an experienced premises liability and workers’ compensation law firm that can investigate both claims and help an injured person optimize recovery for damages for lost wages, medical bills, and pain and suffering.